It has been more than a month since I posted my last blog here on the workbench. I kept meaning to post but I always thought I was one weekend away from being done. For all purposes the bench is done now. Yes I need to touch up one of the jaws of the end vise and drill two dog holes in the other jaw’s pad but I do consider it done now. 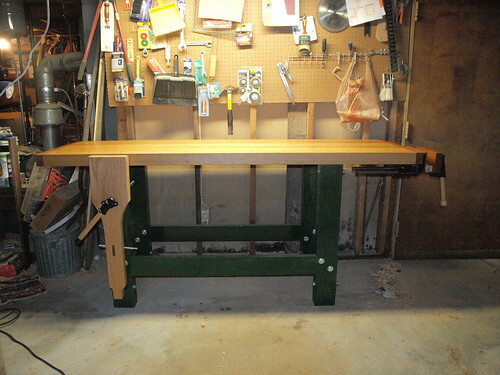 Yes, the bench is based on the Popular Woodworking LVL (glubou) workbench but it has taken on it’s own spirit. The top and leg vice are Oak, the end caps are cherry and the base is engineered lumber. The stretchers are LVL and the legs are PSL. The final sizes ended up being 84×25x37”. A little bigger than I thought I would get, but I am not complaining. I’d like to share some of the challenged I faced and how I overcame them. 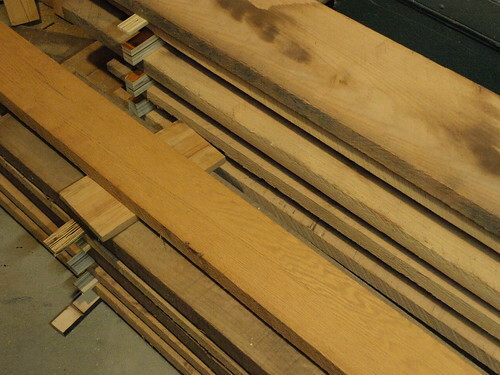 All the oak I was given came rough sawn in seven to eight foot lengths any where from 9 to 14 inches wide. I started by ripping the pieces into 3” wide sections on the table saw with a thin kerf ripping blade. I thought I would gain some cutting speed with the thin kerf blade but when one of those boards started twisting and binding in the cut I think the thinner blade deflected more. It is a bit hard to whip up a riving knife for a blade that thin, so I ended up needing to put in an occasional wedge on the outfeed side of the cut (with the saw stopped of course.) I am not sure how safe that was but it worked. Ideally a Band Saw should have been used to do this. Another challenge was face and edge jointing about a dozen 7ft+ boards on a 6” jointer. I thank God for the wisdom to have changed the knives before I started this project. You get to know your jointer very well after the 4th or 5th board. I think I have mastered that machine now. Milling the boards and ripping them to final width was pretty strait forward. Here is where a thin kerf blade was handy and I managed to get boards finished to 2-3/4. 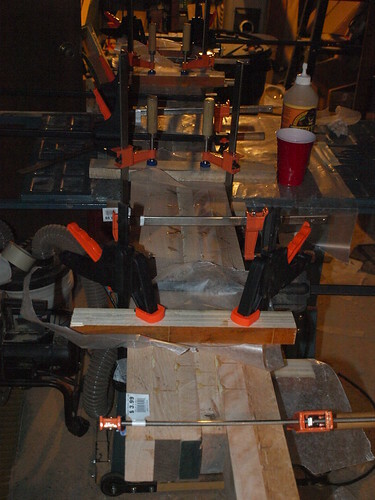 Next I glued up the top in three sections using cauls, clamps, wax paper, gorilla urethane glue, and lots of prayer. I originally planned on pinning everything together with dowels and had enough clamps to glue up all three sections simultaneously. I changed my game plan only because I could not find the 3/8 bushing for my Stanley doweling jig. I think this worked in my favor but rather than getting all my glue ups done in an hour it took me about six. 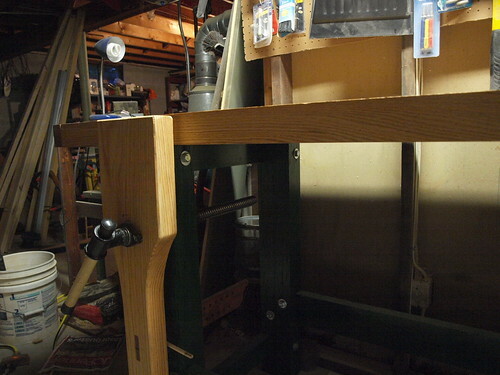 I did this glue up using the flat cast iron top of my table saw to keep things aligned. I then ran all my bench top sections through the planer and came to a final width of 2-5/8. Then came the glue up of glue ups. 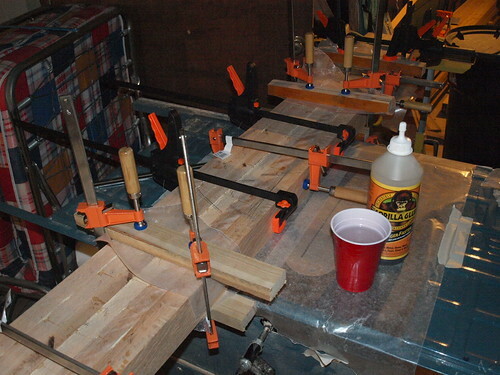 Maneuvering the three large sections together dry fitting all the clamps and cauls. Taking the set up down, adding glue… Then… one of my harbor freight bar clamps had a catastrophic failure when gluing together the sections. I nearly panicked… But I remembered dad’s old pipe clamps behind the furnace and ran across the basement to get them. When the clamps where off there was only one slight mismatch of about 1/32 over the whole top. Not perfect but nothing a hand plane and sanding could not fix. Trimming the top to final lenth was a challenge that was easily overcome. I sawed through the top as far as I could with a circular saw, then finished the cut with a handsaw. I then clamped on a strait edge and used a router to cut as much off smooth as I could. Flipped the top and used a large flush trim bit to clean the rest. No photos here but I will say cutting dadoes in PSL is like shooting hundreds of toothpicks at yourself. I switched over to wearing a face shield very fast. The LVL on the other hand was great to work with. Just like using heavy duty plywood. As a matter of fact I made myself some winding sticks from left over LVL. Remember “If it does not fit get a bigger hammer” only works if you don’t break the piece you are fitting. In my case the mortise for the parallel guide had a slight taper to it. I did not dry fit the parallel guide more than a half inch deep… Add hide glue… panic and grab a hammer… Safe to say I broke the piece off and went over to find another piece of stock to make it from. In the end the wedged tenon is so tight I didn’t even use any hide glue. After painting and reassembly PLEASE warn the friend helping you turn the bench over that it is VERY heavy… The first time I flipped it my brother helped and he was the guy moving the top around with me. He was not at home when finished the back side of the top and put the legs back on so I called the friend who gave me the wood. He did not have a good grip and we dropped the bench. No one was injured but it has its first ding of honor in the corner of the end cap. So here it is. 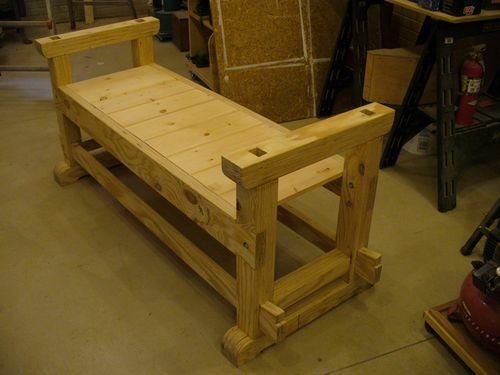 The finished bench! This was a great blog with a great finish .super bench. I followed your progress and have to say nicely done. That is sweet! You are really going to enjoy this for years to come. good job on the lamination, what process did you go through fro drilling the dog holes? Nice That’s one tough top. I also used LVL’s for my base, I know about the toothpicks, like being stung with a whole hive of bees. Great job enjoy. 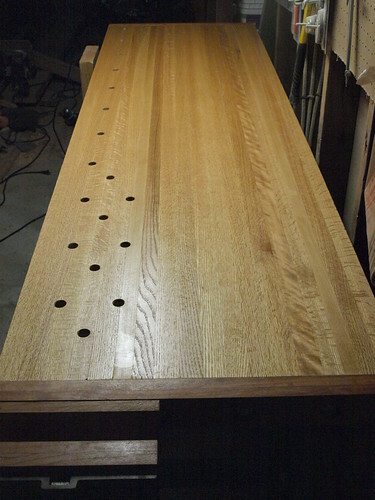 David, I just used a 1/2 drill, Irwin Speed Bore drills and a lot of care that the holes would be somewhat strait. Thanks for posting this. 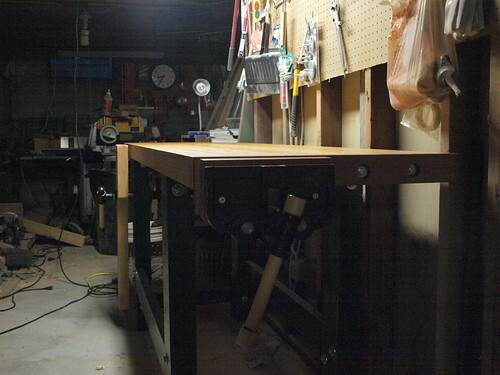 I am dying to make a workbench. I recently sent my Brother on a craigslist buy for me to pick up some rough sawn oak. Much to my surprise, it was NOT a typo in the description. They were in fact split 7-8 FEET from the ends, and not INCHES! Anyway, it dawned on me that I can rip this wood down as you have for my top. I was looking to see if anyone had done something like that.